Plants cespitose, not rhizomatous. Culms 40-100 cm tall, 0.6-2.6 mm thick, glabrous or sparsely pubescent to 5 mm below the lower nodes; nodes 4. Basal sheaths becoming flat and papery in age, margins some¬times ciliate distally, cilia to 0.5 mm; collars, including the sides, glabrous or sparsely pubescent, collars of the flag leaves glabrous; basal ligules 0.2-1.3 mm, membranous, truncate, erose to ciliate, cilia about 0.05 mm; upper ligules 0.3-1 mm; blades 1-4 mm wide, abaxial surfaces smooth, adaxial surfaces scabrous. Panicles 12-28 cm long, 0.5-1.5 cm wide; branches ascending to appressed, straight, longest branches 3-6 cm. Spikelets appressed to the branches. 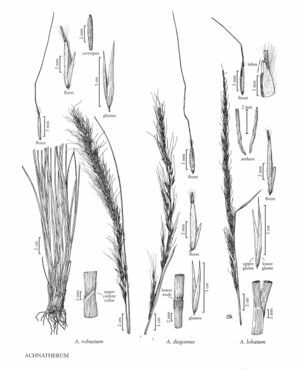 Glumes unequal; lower glumes 9.5-12.5 mm long, 0.8-1.2 mm wide, 3(5, 7)-veined, apices straight to somewhat recurved; upper glumes 2-3.5 mm shorter, 3-veined; florets 5.5-7.5 mm long, 0.6-1.1 mm thick, terete, widest about midlength; calluses 0.3-0.5 mm, blunt; lemmas evenly hairy, hairs at midlength 0.7-1.2 mm, fusiform, terete, apical hairs 1.3-2.2 mm, erect, usually less than 1 mm longer than those at midlength, apical lobes 0.5-1.2 mm, membranous, flexible; awns 10-22 mm, persistent, once- or twice-geniculate, scabrous, terminal segments straight; paleas 3-4.3 mm, 3/5 – 3/4 as long as the lemmas, pubescent, hairs exceeding the apices, veins terminating below the apices, apices flat, rounded; anthers 3-4 mm, dehiscent, sparsely penicillate, hairs about 0.1 mm. 2n = unknown. Achnatherum lobatum grows on rocky, open slopes in pinyon-pine and white fir associations of southern Arizona, New Mexico, Texas, and northern Mexico, at 2100-2800 m. It flowers from mid- to late summer. Achnatherum lobatum is similar to A. scribneri and A. perplexum. It differs from A. scribneri in its shorter apical lemma hairs and blunt calluses, and from A. perplexum in having longer lemma lobes and erect apical hairs.